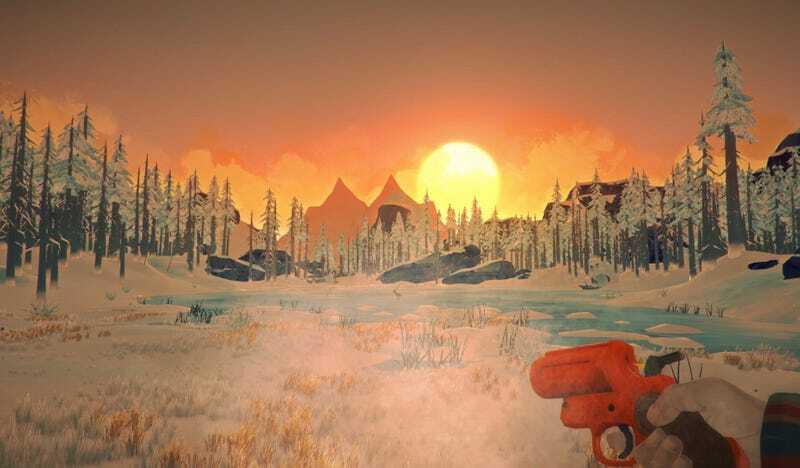 A journey through the world of the freezing woods of the survival game The Long Dark has long been wonderful. The sky constantly changes; the snow is breathtaking. The sound design is rich and detailed, with your pack making different sounds depending on what you’re carrying. The quiet can be overwhelming, until it’s punctuated by the hoot of a loon or the sudden rush of the wind. You’ll light a fire and warm some soup, the crackle of the flames detailed and evocative. Moving through Great Bear is both tense and peaceful, no matter why you’re doing it. It’s not a game that needs a story, but with The Long Dark’s official launch from Steam early access last week onto PCs, Xbox One, and PS4, development studio Hinterland has added one. That narrative mode, which is called Wintermute, isn’t quite The Long Dark I’ve grown to love these last three years, but it does present a welcoming entry point for players new to this brilliant game. The first two episodes of Wintermute span 15-20 hours of gameplay. They’re the only episodes out, though Hinterland is planning five in total. In episode one, “Do Not Go Gentle,” Dr. Astrid Greenwood enlists bush pilot Will Mackenzie to fly her on an urgent mission into the Canadian wilderness. On the way, a strange flash of light takes out the plane’s power, and Will loses Astrid when he crashes in the remote area of Great Bear. He sets out to find her without succumbing to the freezing cold or bloodthirsty wildlife. The second episode, “Luminance Fugue,” takes Will to a new map and further explores the significance of the lights. The Long Dark’s sandbox mode, now called survival mode, is the part of the game most people are likely familiar with, as Hinterland has been adding to and tweaking it since Early Access. Apart from a new map and some revamped interiors, it’s largely the same as it was since its last update in June. In survival mode, there are no quests to complete or characters to interact with. As either a male or female survivor, players simply try to survive the snowy wilderness for as long as they can. The two modes share the same mechanics that make The Long Dark a gripping survival game. You manage your hunger, thirst, exhaustion, and temperature. You loot buildings for supplies and food, or hunt wildlife if you’re lucky enough to find or make weapons. You maintain your clothes and equipment and deal with injuries and illness. You get tired as you wander the world or if you’re overburdened with gear and have to find a safe, warm place to sleep. Your temperature is affected by the clothes you’re wearing, their condition, the weather, and the time of day. Time management is critical. As I’ve written in the past, The Long Dark is a slow game, with every action taking a significant amount of time. During one quest in episode two I had to walk across several maps, and then I had to trek all the way back. In my game, snow started falling, and I had to weigh the threat of getting lost if the storm worsened with the supplies I would burn through sheltering in place. There was a crashed rail car I could hole up in about halfway to my destination, but if it got too cold and I had to stop to make a fire I’d lose precious daylight and risk getting lost in the dark. Every journey, from days-long expeditions to a short jaunt across a lake at dusk, has to be weighed against its own pace and the resources that time will cost you. All of this feels completely different in the sandbox versus the story. How you decide to spend your time in the sandbox is its own end. In the sandbox, my journey across those several maps would be the game. In the story mode, the journey was dictated by a surly NPC I had to please to progress. Having played episode two’s maps in the sandbox, knowing how far I’d have to travel to complete the quest made the distance feel like padding instead of a reward. The Long Dark’s inherent slow pacing can make the story drag. Given my affinity for the game’s survival mode, Wintermute’s storyline characters felt like intruders interfering with The Long Dark’s beautiful solitude. In the Mystery Lake map, heading to the Trapper’s Cabin is usually my first big journey on a playthrough; finding the actual trapper there feels like someone invaded my private outpost. I’ve never wanted to know more about the people who inhabited Great Bear before I got there, preferring the story told through evocative place-names like Max’s Last Stand and Misanthrope’s Homestead. New players might welcome the guidance characters bring, even though the people you meet in the story tend to be unlikable. Even Astrid isn’t compelling as a character. Her and Will’s interactions are well-written and hint at intriguing stories to come, but there’s no time to form an emotional connection that would make finding her feel important. The NPCs exist both to teach you gameplay skills and to move the story along. The first episode features an NPC who insists you bring her wood and food to continue, and while this stockpiling sends you on harrowing treks across the map and is a fundamental habit for survival, whatever supplies I brought her became unusable for me. I found myself starving while filling her fridge with food. There’s a moral quandary at the heart of this conflict—helping someone else versus selfishly seeing to my own survival—but there was no way to progress the story without helping her. Several of her quests necessitated simply passing time, that most precious of resources, but without weighing the risks that makes it meaningful. Part of the town most of episode one takes place in. One of the most controversial changes to the game for story mode is the behavior of wolves. In past iterations of the game, wolves were fairly sparse and easy to evade if you kept your cool. In the story mode they’re plentiful, and they’ll stalk you for miles if you can’t scare them off or get inside a building. There’s a narrative reason for this unrealistic behavior, and they usually won’t kill you if they do attack. Their determined patience is terrifying, but it can make progress difficult. New players might welcome the drama, but they might also find it overly intimidating. New players, coming in without expectations and habits, might not have the qualms I’ve had, and they may appreciate its novel blend of survival and narrative. Story quests are bare bones enough—go here and fix this, find an object at that location—that the actual surviving will be the bulk of your time. No two players will have quite the same experience of a quest, but this hangs on scripted structure to keep the game moving. It may be best for us Long Dark veterans to view the story as a tutorial for new players. The first two episodes introduce mechanics like crafting and fishing through the story, and I’m excited to see what future episodes do once the player has all the requisite skills. I found the presence of a story more of a hindrance, but The Long Dark’s sandbox is still so impossibly good that any quibbles I have about Wintermute don’t matter. That world has gotten even more beautiful, with new colors and details that are cartoonish but moody. The Long Dark is still wonderful just to be in: watching the sun set through knocking trees, darting outside at night to stare at the dizzying stars, following a stag through an early morning fog. If story mode is more players’ introduction to these beautiful moments, then it’s a success.